A pair of 19th century compound cabinets in Yu Mu and Hua Mu stand tall at the end of the living room. Traditional Chinese houses were not constructed with closets so cabinets and chests of different sizes were used for storage. This pair of cabinets would have been used as wardrobes, today they have been lined with fabric and fitted with lighting. When the doors open they function as display cabinets for part of Lo's ceramic collection. 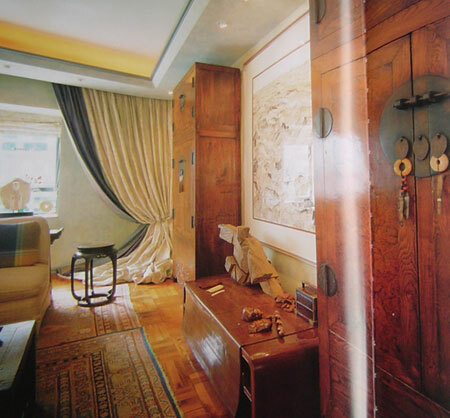 The table between the cabinets is covered with an opium mat, on top stands a Ju Ming sculpture. The painting on the wall is of the Grand Canyon and is by Wu Guanzhong, known for his exciting contemporary work. Wu exhibited at the British Myseum in 1992, the first time the museum held a one-man show for a living artist. An antique country style cabinet acts as a sturdy bedside table. 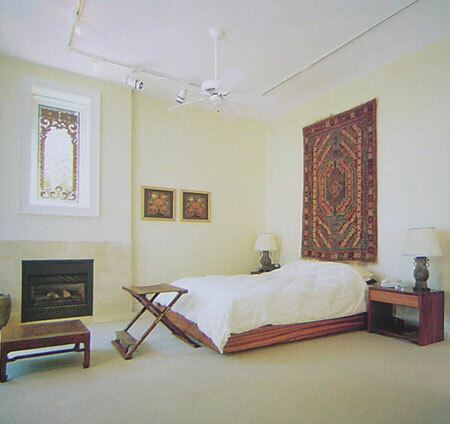 Warm woods enhance a sense of harmony and calm in the pale-hued master bedroom. Beneath the windows (which still feature the original trims) stands a pair of 16th -17th-century yolk-back chairs and a Kang table made of Huanghuali wood. At the foot of the bed is a 17th-century folding stool with footrest; on the wall at the head of the bed is a vibrant Anatolian pile carpet; to the side is a pair of Chinese silk embroideries from the 14th or 15th century. Exquisite Huanghuali Ming dynasty pieces may feature in every room, but this is also an interior meant for comfort and relaxation. 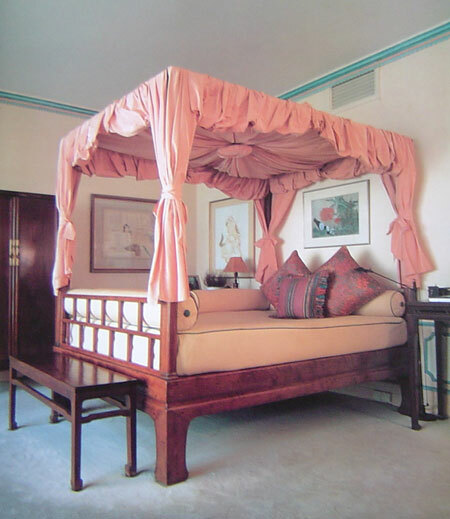 In the feminine master bedroom, a Ming bed has been dressed in the manner of a Western four poster with swagged fabrics and piped detailing. "I find colour is a good balance for my life," says Wu Bruce, explaining that in her galleries she goes to the other extreme architectural lines. Both decorative approaches are equally valid. "I have the gallery in the day and home in the evening. It is perfect for me." The study area contains a low-level, custom-made sofa dressed in white fabric. 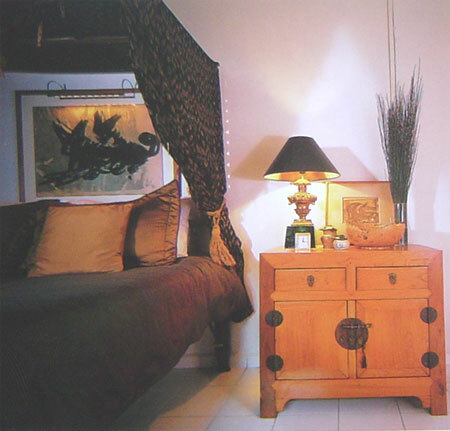 On top is a compact wooden table in the style of those once used on traditional opium beds. 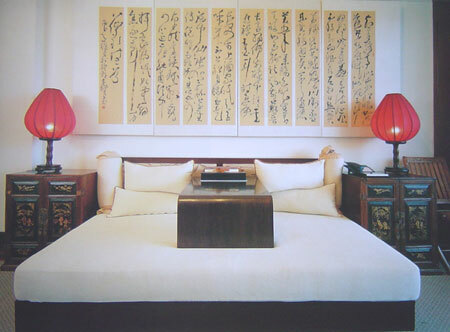 The calligraphy panels were picked up in a street market in Chengdu; a pair of red silk and wook 1930s art deco lamps placed on a pair of painted chests enhances the opium den theme. Symmetry and order define this tableau. 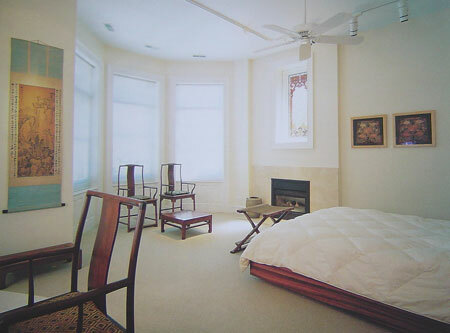 High ceilings in the master bedroom allow space for an oversized four-poster bed which is a modern interpretation of a traditional Chinese canopy bed. 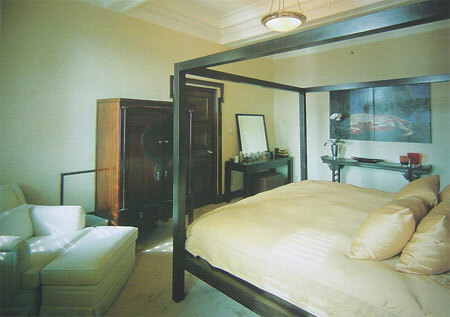 It is dressed in luxurious pale yellow linens which iffectively contrast with the dark wood structure. Above a classic altar table hangs an artwork by Gu Zhen Hua called 'Crab and Helicopter', 1997. From the ceiling hangs an art deco light fitting. Face Shanghai's current owners wanted to recreate a secluded, nostalgic invironment for drinking and kining in modern-day Shanghai. 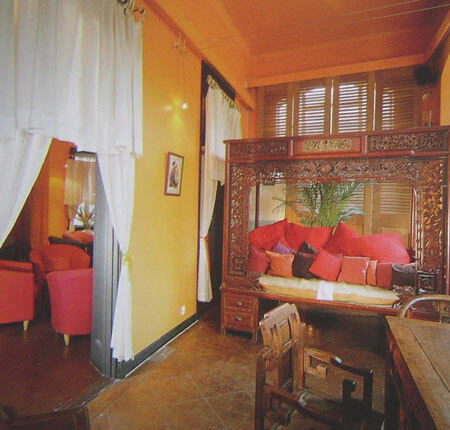 The red brick and stone mansion set in acres of gardens in the heart of the city comprises a Chinese-furniture filled lower bar area which has been decorated with warm orange and red walls to offset the slightly distressed wooden furniture. . The lime green walls in the study perfectly offset a biscuit coloured suede day bed, a modern interpretation of a traditional Chinese design. 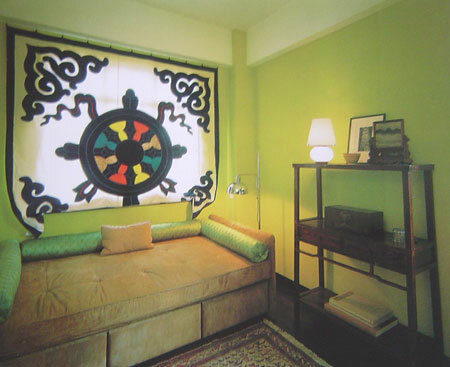 Asian textiles have been used to good effect: Cambodian silk covers vibrant green bolsters and a Tibetan door cover from Lhasa has been turned into a window blind. Built-in drawers under the day bed provide extra storage space.